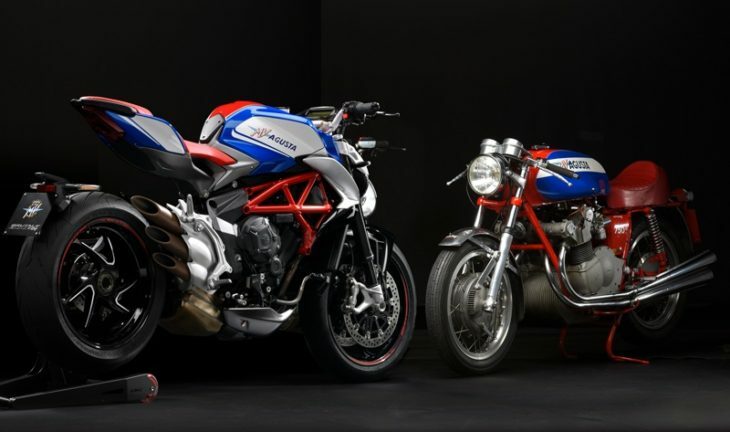 MV Agusta special editions are world renowned and have become highly sought after by enthusiasts and collectors, none so more than those that bare the historic name of past models. The ‘America’ is such a name and for 2018, the new Brutale 800 RR Americasucceeds in the tradition of an MV special edition that honours the past with leading-edge design. The first bike to take the ‘America’ name was the “S America 750” back in 1975, with advanced technical features of the period that included the 75 hp 4-cylinder in-line air-cooled engine with dual overhead camshaft. It quickly broke all MV Agusta sales records globally and became an extremely sought after collectable. More than 25 years would go by before the America tag reappeared on an MV Agusta tank: this was the first Brutale, again with a 4-cylinder engine, the special version of which displayed the red, white and blue of the US flag. In 2012 the evocative power of Americawas back again in the form of a new special, a version again developed on the popular 4-cylinder Brutale. The special edition Brutale 800 RR America will be available from June 2018, with a three-year warranty and two-year customer care program for MSRP $18,698 USD. Pre-orders can be arranged through your local MV Agusta dealership or by contacting MV Agusta directly through the mvagusta.com website. What MV isn’t a special edition these days? They have been riding the “special edition” train for 20 years. One day, 50-80 years from now, collectors will be chasing rare and highly sought after “Standard edition” MV’s as they will have been built in significantly smaller numbers than any special edition bike.